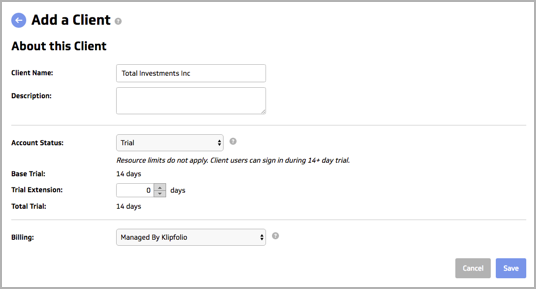 You manage clients in the Clients section of your Klipfolio Partner account. Set the Account Status of the Client account. Learn more about Client status options. At Billing, specify if you want the Client’s billing managed by you, the partner, or by Klipfolio. In the Clients section, click on the client's name. Click the Delete Client button. You can assign users for clients and add or remove resources (for example, dashboards, private links, and Klipfolio API calls) in both Trial Mode and Active Mode. You do not need to set up a Trial Mode account before switching to Active Mode in order to add and remove users and resources. In Trial Mode you can give your clients hands­-on access to a free 14-day trial account with the option to extend the trial by another 14 days. You can add as many dashboards and users as needed; they do not count towards the limits in your plan. To learn more about adding users, click this link. In the Clients section, log in as an Admin for the client to which you want to add users. Navigate to the Users section. Click Add a User and fill out the required details. Add the user to any applicable groups. Note: If you will be managing the billing then you will need sufficient resources available in your plan before you can change client accounts from Trial to Active Mode. The amount of resources available to your Active clients (for example, number of dashboards, users, or API calls) will depend on the level of plan you have purchased with Klipfolio. In Active Mode, clients have access to operational, paid accounts. The number of dashboards assigned to an Active client determines how many can be maintained for that client and reduces the remaining number available for you to use in the Parent account. In the Clients section, click on the Client name. Click the Edit link at the top of the page. Modify the number of dashboards, API calls per day, and users. Within Klipfolio there are various ways to share your dashboards with your clients. Grant access to users: You can grant specific users access to client dashboard accounts by creating custom roles with unique sets of permissions. Learn more: User roles and access permissions. Share default dashboards with groups: A group enables you to set the dashboards a user will see when they log in. Learn more: Sharing dashboards with groups. Share via published links: Published links enable you to share your dashboard with others, even those outside your organization or account. Depending on the settings you choose when creating published links, your dashboard can be publicly available and indexed and searchable by web search engines, or you can add heightened security and privacy by only allowing access to those with the URL link and password. Take a look at some of our very own public dashboards. Learn more about published links. Share by email: You can set up regular email snapshots based on individual data visualizations or entire dashboards. You can schedule emails to send to specific users, at specific times, and based on a predetermined frequency (for example, daily or weekly emails). These reports can be generated in PDF or Image format. Learn more about sharing dashboards via email. Display on wallboards: You can set your dashboards to full screen TV mode within Klipfolio and display them on office wallboards and monitors. Learn how to share your dashboard on a wallboard. Share with Slack: Learn how to share Klips and dashboards with Slack. Learn how to share your dashboard with Slack.